Daikanyama, the village styled neighbourhood sandwiched between Shibuya and Ebisu, has had a great run in the last few years. 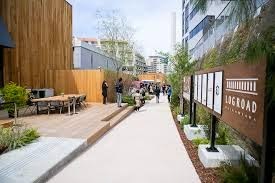 Already home to some of the most fashionable stores around, T-Site opened providing the outdoor street side cafe environment Tokyo cries out for. The fact that the organisers also like classic cars and hold Ferrari and Austin Healey rallies there on a regular basis doesn't hurt too much either in my book. Then the accursed level crossing was closed and the train line was dropped below ground level. Overnight. And if you'd like to see that happening, you can find it here. Honestly, you'll catch yourself cheering with the crowds. Then it was announced that the new Shibuya Station redevelopment will provide direct access on the south side of the 246, the main East / West highway through Tokyo, some five minutes walk away. And now the unused remaining rail tracks above ground have been converted into a new pedestrian area. A Fred Segal luxury lifestyle experience and the world famous Tartine Bakery and Cafe. And tomorrow, Kirin are very kindly throwing a Grand Opening party. If you happen to be in the area, should be and interesting time. But the question of questionable English arises once again. Why "Log Road"? Even "Timber Road" would be better. Then you could have a few beers and stand at one end and see if your voice carries the entire length as you shout the predictable "TIMBEEEERRRRRR!" Which you just know is going to happen now anyway.